Carpenter bees are generalists, thus they frequent dozens of genera of Florida wildflowers, including Amorpha, Asclepias, Aster, Bidens, Coreopsis, Erigeron, Eupatorium, Euphorbia, Geranium, Helenium, Monarda, Penstemon, Polygala, Sebatia, Scutellaria, Sida, Silphium, Smilax, Solidago, Stachys, Teucrium, Tradescantia, Verbesina, and Vernonia. Carpenter bees are categorized by their size. 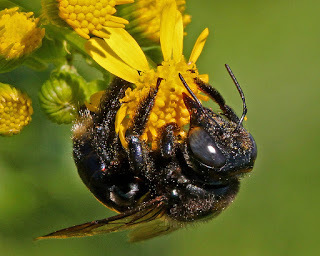 Small carpenter bees (Ceratina spp.) 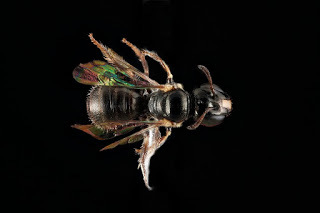 are less than 8 mm long, and large carpenter bees (Xylocopa spp.) are 20 mm or larger. That’s the easy way to tell them apart. Ceratina cockerelli is found throughout Florida and the eastern United States. It is the smallest of the species in Florida (from 3 to 4.5 mm) and is mostly black. Flower preferences include oakleaf fleabane (Erigeron quercifolius) and blue-eyed grass (Sisyrinchium rosulatum). Ceratina dupla floridanus is a subspecies of the species Ceratina dupla, found in the eastern United States. It is metallic blue and from 6 to 8 mm in size. Host plants are many including those in the aster and mint families. Click here for photos and more information on how to identify small carpenter bees. DID YOU KNOW? Ceratina are parthenogenetic, which means the female can produce female eggs without mating or fertilization. 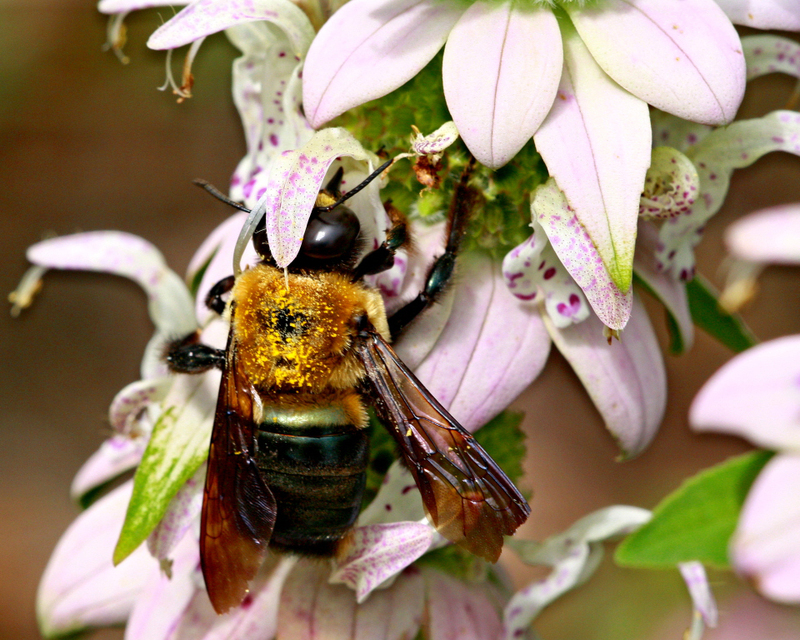 The Eastern carpenter bee (Xylocopa virginica) is found throughout Eastern US and North Florida. Xylocopa virginica krombeini is a Florida subspecies found from Sumter and Lake counties south to Dade County. The Southern carpenter bee (Xylocopa micans) is found along the coast from southeastern Virginia to Florida, and west along the gulf to Texas. Xylocopa micans on Packera glabella. Photo by Mary Keim. Both species are similar in size and are often mistaken for bumblebees. Their color may be black, metallic blue, greenish black, or purplish blue and may also have slight yellow pubescence on the thorax, legs or abdomen. Bee taxonomists distinguish each species by determining the distance between the eyes, the number of antenna segments, types of submarginal cells in wings, and abdomen and thorax color and pubescence. Flower preferences include many native shrubs but also wildflowers of Aster, Bidens, Hibiscus, Monarda, Solidago, Stachys, Teucrium and Vernonia species. Click here for photos and more information on how to identify large carpenter bees. DID YOU KNOW? Xylocopa is greek for “woodworker,” referring to the bees’ ability to make its home in wood. In Florida, the bees are active most of the year and may nest in February and March and again in summer months. In the wild, the bees prefer nesting in conifers such as cypress, pine or juniper. They may nest in the same area for generations. Large carpenter bees chew nests in wood, and can use fence posts, stumps or dead tree branches. They also use wood on houses that is not painted or varnished. Carpenter bees can have horizontal or vertical nests, depending on the direction of the wood’s grain. Female bees will mix pollen and regurgitated nectar (“bee bread”) in the nest tube, lay one egg on it and then wall it in with a piece of chewed wood pulp; they repeat this process until six to eight eggs are laid. She will stay with the nest until the brood hatches. Newly hatched females often share the nest with their mother. This behavior is unusual among bees, in general; most female bees do not live long enough to meet and share a nest with their offspring. Large carpenter bees, however, can live up to three years. Although carpenter bees do not usually sting, they may dart around their nests protectively or fly at humans who approach their nest. Only females have stingers, but they rarely sting unless they are provoked. DID YOU KNOW? Large bees like the large carpenter bee can forage for distances up to 1 mile from their nesting sites. But the shorter the distance the bee has to fly to forage, the better. Lee-Mäder, Eric. Attracting Native Pollinators: Protecting North America’s Bees and Butterflies: The Xerces Society Guide. North Adams, MA: Storey Pub., 2011. Print.